The ladies are in full swing at the Tokyo Bible College in their conference. Thanks to Anna in Tokyo she made this picture so we can all enjoy. Be blessed ladies, grow in Jesus! Pastor Santo is teaching this morning for us in Lectures I ministry. Because of Apple TV we are able to stream live and project from the TV. Again, please join with us in prayer for the Typhoon that is heading our way. It is a category 4 right now and it is supposed to hit us as a category 3. (Look how big the eye of the storm is). Please pray that it looses steam and drops down quickly. Pray that it passes by us fast so that we can have Sunday Services. Also, Joanna flies out of Tokyo on Sunday evening, and it is supposed to pass by Tokyo during that time. Pray for her safe flight. Thank you so much. Pray, Absolutely works! CCBCJapan is hosting a Calvary Pastor's wives conference in Tokyo. Many of the Calvary wives are flying in. Please pray for a blessed and fruitful conference for the gals. Hello everyone, please keep us in your prayers as another typhoon is rolling through. It should not be that strong by the time if gets to us but we do not want to take anything for granted. 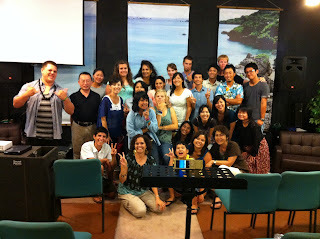 The Typhoon is supposed to roll in Saturday so please pray that we will be able to have Church Service. Asa is tired of doing homework and he is trying to show you. He has to read to Joanna and he does not want to. Don't worry folks, he still has to, he cannot get away from "homework duties". Getting back from Tohoku with the Robb's we were able to make it back to Fuchu in time for their Friday night Bible Study. It is a blessed time in that we gather for a Koinonia meal and then Pastor Rich teaches the Word. A blessed night indeed. We were so blessed to spend time with the Robb's in Higashimatsushima. Thank you Pastor Travis for driving us up to their home. We had a blessed time in fellowship and encouragement. This was a first visit for most of them. 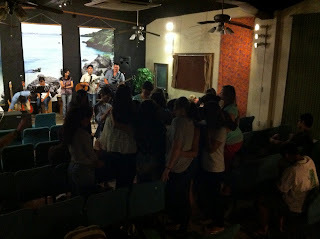 The Bible College Students spent time praying for the Robb's and the new ministry that the Lord has given them. 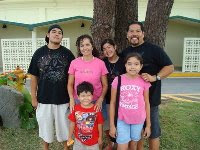 They are ministering at the local community center with the young kids. God is doing a good work. Pastor Travis made us his famous Teriyaki burgers. They were delicious! Everyone fell in love with them. We all eat good with Takamiyasan. Chuck and Yumi took us for a nature hike next to their house to a secluded beach. It was so beautiful and we were blessed! Anna (Mi-chan) hates spiders and they were everywhere. This is the view that we had above the hill at Chuck and Yumi's house. We trained this morning using the PT Straps. The view from here is gorgeous. The harvest is coming soon. The rice is ready to harvest as it is turning golden brown. To the Japanese, rice means life, everything about the Japanese culture revolves around rice. Gyoza Manchu: one of our best Gyoza joints to eat at; a favorite of Mr. Tom Cotton. Before Wednesday night service at CCTOKOROZAWA we had a good dinner. Hannah is working hard at CCFuchu Daycare Center. Plus she is a full time student at CCBCTOKYO. Please pray for Hannah in that Friday she will be heading up to Sapporo to spend time at Calvary Sapporo with Pastor Steve Loreinz and family. God bless you Zach and Hannah. Our missionary to Tokyo, Mr. Tokito making his famous stew. Toki is always a blessing to see. Please pray for him to be continually led by the Holy Spirit. The other day someone donated a box full of local mini-banana's so let them ripen and took them to the Bible College here in Okinawa. They were delicious! Local grown, healthy. Really good for you and expensive. I saw some for sale the other day, 1,170yen for 10. (about $13.00usd). Joel the other day ate 5 of them at one sitting, he ate about $6.50 worth of bananas. No wonder Anna was telling him to calm down. Again, they were healthily delicious! CCBC OKINAWA special dinner. It is a Japanese holiday today but we celebrated Mexican Style (Eder would be proud). Tamales with mole, Spanish rice, chicken tacos, homemade tortillas, cabbage salad and salsa. Absolutely delicious! A good evening start. Today is a major holiday in Japan. The students in Tokyo had a rooftop BBQ on top of the College building. Pastor Rich from CCFuchu joined the crew for what Zach called "A Pig Fest". They chowed down on all kinds of meats and dishes. They were so full, and I am so hungry. I was hoping for a better shot of the crew, but this is the best they sent me. But you get the idea, look at the beautiful sky above and the cool set up. Please continue to pray for the Bible College Crew in Tokyo. 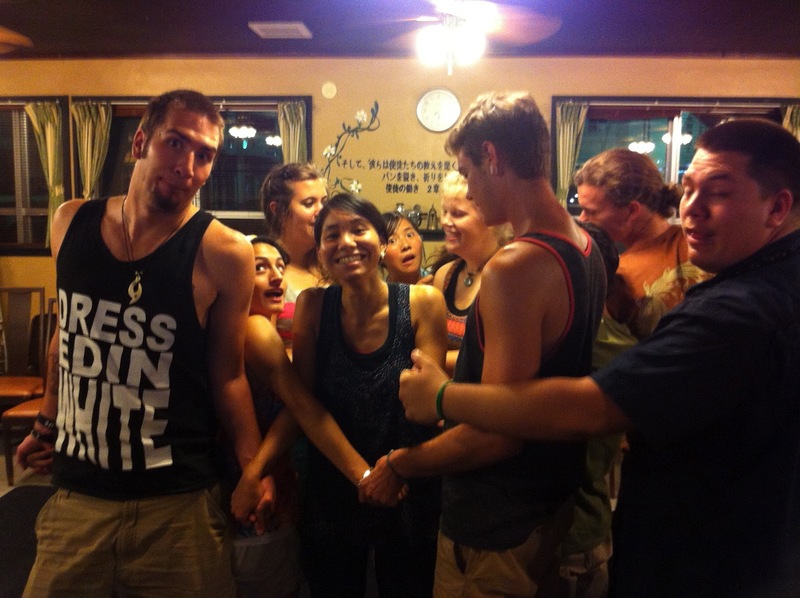 Two weeks ago Joel took the Oki Crew out to Nago to the Pineapple Park. They had a blast! After that, they went to the Aquarium, they were Rockin Nago! Oh the joys of birthdays. Young and getting older. Don't worry folks they are still in their early twenties! Happy Birthday to both of you! Praise the Lord! Hello everyone, please pray for us in that tropical storm Sanba has formed in the Pacific. It is making its way to Okinawa. Please pray that it softens and turns in direction. I want the surf, yes, but not the strong winds and the torrential rains. In the words of Aaron "knarly bits" like eating chicken fat and cartilage. He is one brave dude! Pastor John is totally committed to missions. He is now on the missions field 6 months of the year. He totally blessed our hearts this morning. Hokkaido and Okinawa represent! 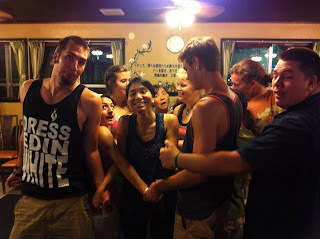 We took the Sapporo group out for a night on the town. It was a lot of fun. We even brought our Indonesia sister with us. The light show from Hong Kong Island began at 8pm. We barely made it. It was so beautiful as the island totally lit up. There were so many people watching the show. Pastor Phil Twente is leading the Conference and gave us a great welcoming greeting. John Chubik and Randy Fleming from Cambodia both gave us incredible messages. I have been totally blown away. This does not happen usually on the first day. Joe and Aaron arrived safely and are all set in. We met at the hotel for a local lunch before the conference began. This was their first real Hong Kong lunch. The beach at Stanley is beautiful. The sand is thick and the view is awesome. Chillin out and catching the sights before the conference begins Monday. After w2 the team spent some time praying for Taliya, sending her out in the Name of Jesus! We are going to miss our sister but we are excited for what the Lord has for her next. In the past few weeks we have had some wonderful gals move on from our fellowship; Naoko, Chara and now Taliya. To God be the Glory! Go forward in the Name of Jesus! It has been a blessing having Taliya with us for these past years. She is a recent graduate from CCBCOkinawa and now she is heading to intern at CCBCKorea. Taliya has a love for Korea and we are super blessed to be able to send her out in the Name of Jesus. We would love to have her with us, her continual service at the Church in Children's ministry is priceless, but she needs to continue going forward following Jesus Christ. We love you Taliya, we are going to miss you, but we are so proud of you!!!!! On Saturday night the Oki crew had some fun at their game night. The interns planned some fun games for them to get to know each other. It looks like they are having a lot of fun. The only way to roll in Japan. We are heading to Stanley Market to check out the sights. Last year Snider turned us on to this place. It is right near the beach on the Southern part of Hong Kong Island. It is quite beautiful with some cool shopping areas. The bus ride shoots us right through the mountain. It is fun traveling with the Locals. China locks out Facebook in China so I can only upload on e3missions. In fact: e3missions is blocked too. But we can still upload. Not every day you are the first to board a flight. Hannah got off the bus first into an empty plane. We are on our way to Hong Kong this morning. Happy Flying! We have to start our day early today to fly out to Hong Kong. The morning is beautiful! No training this morning, it is Sunday, so I am able to relax and enjoy the early start. I like to go to the street venders in Shanghai. I don't know the language but I use my Japanese language skills (just point, use jesters, you all laugh at me in Japan but I always get the communication across) I ordered fried rice and fried noodles. It was delicious! The total price; under $6.00 dollars for a good, tasty meal. We landed in Shanghai getting ready to pick up our bags and catch the shuttle to our hotel. It is already dark but perfect timing. I am amazed that the weather is cool. Hannah and I are flying to Hong Kong via Shanghai, China. It is not a direct flight but it is a cheaper flight. We will spend the night in China and the. Head out in the morning to HK. We have to be in HK by Monday morning so we will arrive Sunday afternoon. I hope to post a lot via China and what is happening in Okinawa.